Work package 6 provides laboratory facilities required for maintenance of salmon lice stocks to provide animals of all stages to researchers year round. 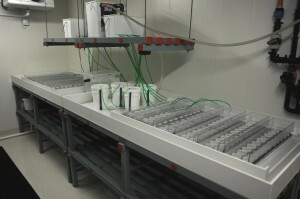 The WP6 wetlabs have facilities at UIB, at IMR and at Ewos Innovation offering a wide range of experimental facilities. The wet-labs have facilities to perform infection and vaccine trials, cutting edge facilities to perform RNAi screens (experiments where expression of selected genes is turned down) and the opportunity to perform selective breeding in order to develop special strains of salmon louse. Wetlabs where salinity and water temperature can be manipulated are also available and a range of different fish tanks to accommodate the need for large scale experiments as well as small individualized experiments are available to the users. The salmon louse life cycle consist of 8 different life stages of which most takes place on a fish host. To enable salmon louse to breed in the laboratory we need to infect fish (Atlantic salmon) with copodids (the infective stage) and maintain the fish until the salmon louse develops into adult stages. Fertilized egg strings can then be removed from females and hatched in buckets with continuous waterflow. The eggs hatch in the container and develop through the two nauplius stages to the copepodid stage, which can then be used to infect new fish.